4 Wheels & 4 Helping Paws: Complete your Christmas with Chocolates! Delicious foods as well as fun surprises contribute to a joyful Christmas celebration. In fact, a gift giver can enjoy shopping for just the right combination of appealing gifts for their friends and family. The following are some gift suggestions that loved ones will appreciate. Christmas crackers are great stocking fillers for people both young and old. You may want to choose several crackers covered in a variety of shiny, colourful wrapping paper. You should consider the recipient when deciding upon the special gift inside the Christmas cracker. For example, a young girl may enjoy a Christmas cracker with a stylish compact mirror hidden inside it. Alternatively, a young boy may appreciate a deck of playing cards. Adults would like to find a beautiful writing pen tucked inside their Christmas cracker. When it comes to stocking fillers you can't go wrong with chocolate! You may even want to consider giving a special person like their mum two stockings; one filled with Christmas crackers and the other with dark or light chocolate treats! A box of chocolates or biscuits on Christmas also makes a fabulous gift. By choosing to give this particular treat a gift giver is allowing him or herself many creative options. For instance, if a friend really loves this scrumptious treat in the white variety the gift giver could arrange them in an elegant white box with a matching ribbon. If a spouse enjoys eating both light and dark, then the gift giver may opt for an enticing arrangement that includes both varieties. An addition of nuts or filling are just two other choices for this gift giver to consider. In short, a person who wants to give this delectable treat as a Christmas gift to loved ones has no shortage of appealing options. Each Christmas, many people choose to give chocolate to loved ones. It is important for the recipients of this delicious gift to keep it out of their dog's reach. Dog's are curious animals and may try to sample these treats. This delightful gift can be harmful to dogs and make them very ill or worse. Dog owners should make sure that they are the only ones partaking in this wonderful present. 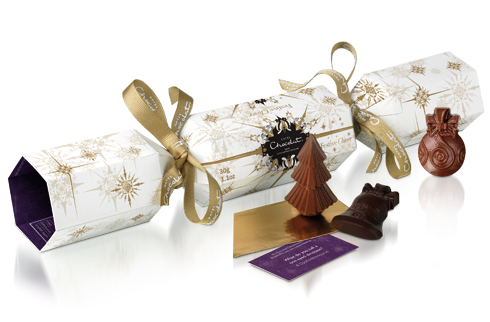 Finally, thoughtful gifts such as Christmas crackers filled with chocolate are sure to please family members and friends as they celebrate the day.